If you have ever thought of getting yourself an electric shower and looked around the market. Then we are sure you have come across this product called Triton Seville electric shower. The Triton Seville electric shower is one of the best selling products available in the market. Different customers have a lot to say about it. However in case if you are not sure whether you should go with this electric shower or not and looking for a Triton Seville electric shower review. Then you better stick to this page till the end. As in this article, we will be talking about the Triton Seville electric shower so you can understand if it would be a worthy purchase or not. However, you can check out other Electric Shower Reviews also. Triton Seville electric shower is one of the best electric showers available out there. The electric shower is available in different KW versions. These versions are the 7.5kw, 8.5kw, 9.5kw and 10.5kw. Also, the look of the electric shower is pretty unique and focuses on making your life as easier as possible. If we talk about the electric shower, well the Triton Seville electric shower comes with a simple dial control. Using the dial control button, you can easily start or stop the power selection. Also, you can switch between cold, economy and high modes. The best part of the dial temperature control is that you can easily control your preferred temperature by rotating the dial. Also, the electric shower comes with multiple cable and water entry points. This helps you to replace your existing electric shower easily. Along with the electric shower, you will also get the white/chrome riser rail kit with soap dish. The shower head holder is also adjustable. However, the set back of the Triton Seville electric shower is that it only has one spray pattern. So you will have to compromise a spa-like feel if you go with this electric shower. But if you consider the price, well then it is pretty justified. The built quality of the Triton Seville electric shower is pretty great too. It is made for long lasting usage and will offer you the reliability. Even in addition to that, you are getting 2 years of warranty. So that was a quick overview of the Triton Seville electric shower. Now to give a better understanding, let’s talk about some of the top key factors of the shower which will help you to understand why you should go for this one. 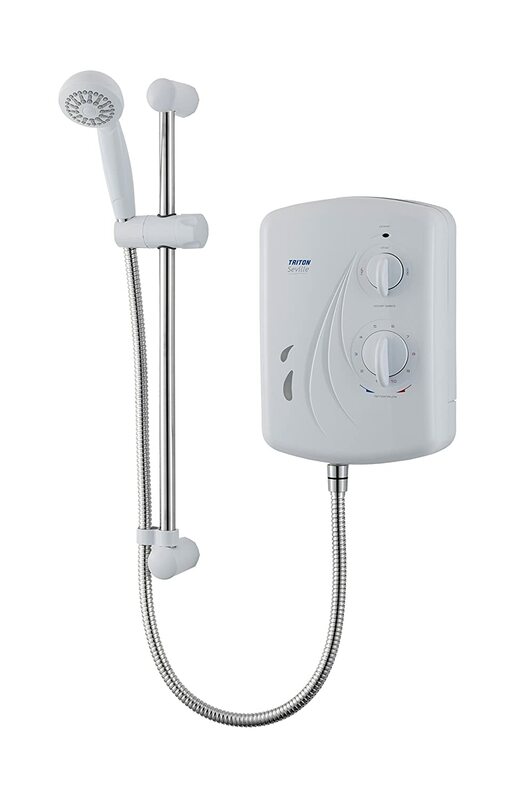 First of all the Triton Seville electric shower comes with easy to use controls and they are very easy to understand. It has a rotatable dial control which you can simply rotate around to select your preferred temperature. Also, you can use the rotatable dial to turn on and off the shower. There is absolutely no tricky controls that you need to understand. Just rotate the dial, and you are good to go. The best part of the Triton Seville electric shower is that you can take a shower with cold or hot water according to your needs. It uses multiple cables for water points which help the electric shower to offer cold and hot water on your demand. At the end talking about the hardware. Well, the Triton Seville electric shower comes with a high-quality plastic material. This ensures that your electric shower is lasting longer. The dial control of the electric shower is also made of the same plastic material, so you do not have to worry about damaging it too soon. Also, the shower is easy to clean and comes with a flexible water hose. However, it has a single spray pattern. The spray flow of the electric shower is not too heavy or light. It is pretty much average and does the job. So these are some of the top key factors of the Triton Seville electric shower. Now let’s just go ahead and have a quick look at the top features, pros, and cons of the electric shower. Multiple water and cable entry points. Comes with riser rail kit and soap dish. Easy to replace because of multiple cable and entry points. Easy to use dial control. Triton Seville electric shower is one of the best compact electric showers that you can find in the market. It has pretty great features and very convenient to use. Overall, if you have a decent budget to invest, then this is the one you should go for.